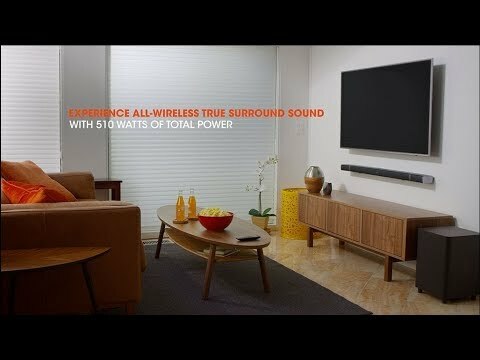 JBL Bar 5.1 is rated 4.2 out of 5 by 65. Rated 5 out of 5 by G Mil from Set it up Properly! You will be blown away! I usually don't leave reviews but when I was researching what system to buy for my man cave I came across a lot of mixed reviews and it was very confusing to me. I think a lot of the reviews you read with this ( and a few select other) systems contains a lot of misinformation, paid bad reviews by competitors, and quite frankly honest reviews from real consumers but with bad experience due to operator error, poor placement/install and a sheer lack of ability to follow simple directions. Here are my details and findings: I have this system installed in a basement man cave roughly about 20 x 15 with some irregularities i.e. angled walls, under stair well opening. The room is drywall finished with half carpet and half tile. This system fills the entire space with spatial audio spanning the entire frequency spectrum. The audio is clear and concise and dialogue is highly intelligible. Anyone who says this system lacks mid range clearly does not have something set up right.The mid range is punchy and direct. Where other modes (sport, movie) clearly have a mid range cut and push the highs and lows more which I personally find more desirable. I have found 'movie' to be the most even distribution of the entire frequency range. However, If one desires the push for more mids all they have to do is simply punch 1 button(mode) and select "voice". It is clear as a bell that this mode easily has a +3 to 4 dB boost at 1k with most likely a -2 dB cut at 4k and -4 to 6 dB cut at 100 Hz. I don't understand how you could want/need more. You have to keep in mind that if you are watching through a TV provider(i.e. DirecTV, Time/Warner, Comcast) different channels broad cast audio in different sound modes which will affect tonality of your audio. For instance, when watching the Penguins on Root Sports they only broadcast in standard definition 3.1 which is nothing but mid range and not very pleasing to my ears but when I switch to NFL network or NBC Sports who broadcast in true 5.1 HD surround the audio is evenly distributed across all 5 channels and very even through all frequencies with pounding lows which I prefer. I'm on DirecTV dish service. The sub woofer is super punchy and powerful. It fills my entire area with bass that you can both hear and feel. At times, it shakes the walls not only in my room but in some of the upstairs areas as well. If good powerful bass is a desire for you you will not be disappointed by this sub. It paired easily with the soundbar and I have not experienced any latency or connection issues here. The option for the removable rear TRUE wireless surrounds has been stellar in my opinion. This worked perfectly for me as the drilling and fishing of wires was a last resort option and quite frankly I didn't really want to go there. The audio from the rears is crisp and clean and surprisingly very powerful. I simply remove them and set them on shelves in both the left rear and right rear of the room and it fills the back (bar) area with pleasant sound. I have only owned the system for 30 days so I can't speak for the battery life and durability. I do suspect this will become an issue at some point but I am hopeful that JBL with have some work around when the time comes. The durability rating is based upon my short experience thus far. I think correct placement of speakers is important to the overall quality of sound for this system(or any for that matter)and definitely is required in order to calibrate the system properly. If you take the time, educate yourself, connect the system properly ( IMPORTANT: it is possible to connect it improperly but still get sound), tune and calibrate the speakers you will be blown away. Btw, I owned and operated a small regional sound company providing professional audio to bands, Djs and speaking engagements for 15 years. Currently, still have a small P.A. set up in my house for private karaoke parties(JBL speakers of course) and have a 5.1 surround system installed in another media room in my house with Harmon/Kardon receiver and infinity speakers. I hope this helps. Rated 5 out of 5 by mcgomez from Best I've ever heard!! I've had this sound bar set for about 1 year and I can't say enough good things about it. The build quality is great! When I first took it out of the box you could just tell it was a quality built product. They really took their time and designed this right. The sound is superb. It really fills the room without being distorted. It feels like being in an iMax theater. It's that good. I can't believe it. Especially at the price. Unbeatable. Rated 5 out of 5 by Jsjahonda from Great product sounds great Going on a month and I love it. It is one of a kind . The satellite speakers can also be charged remotely through its USB charging port. In order to keep them independent 24/7, can I use regular phone charger to charge the batteries? Yes, each wireless surround speaker can charge via the USB connector, located on the bottom of the speaker. Hi, I paired my soundbar with my TV using ARC., this way I can also use my tv'S remote controller for the sound bar. WHen I turn off my tv, the soundbar goes on standby mode. Is there a way to to make it turn off completely when turning off tv? Thanks! Stand by is the only option i guess... there is no option turn it off completely (at least based on the manual). Please correct me if i'm wrong. Correct, The JBL Bar 5.1 Supports HDR/HDR10/Dolby Vision pass-through as the HDMi Ports in the bar are HDCP 2.2 which should be compatible with it. Unfortunately, Dolby Atmos and DTS-x are not supported .